The world's leading hotel group headquartered in France, Accor Group has recently appointed its new CEO, Mr. Gilles Pélisson. On Jan. 10, 2006, the new CEO delivered his address and visions to more than 6,000 executives and staff of Accor hotels in Europe, USA, Germany, Morocco, Japan and Korea, etc through real time satellite video. 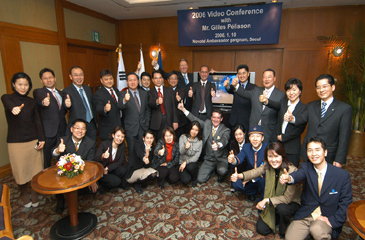 In Korea, the real time video conference was held at Novotel Ambassador Gangnam Seoul for 2 hours from 11 pm (3 pm in French local time) on January 10 with general managers, resident managers of 5 Accor hotels in Seoul including Douglas Barber (General Manager of Sofitel Ambassador Seoul), Jerome Stubert (General Manager of Novotel Ambassador Gangnam), Anthony Mirza (General Manager of Novotel Ambassador Doksan), S. Y. Chung (General Manager of Ibis Seoul), Bruce Lee (General Manager of Ibis Myungdong) and several heads of department and staff of Novotel Ambassador Gangnam. Staff and executives of Accor hotels in Seoul gathered at the Novotel Ambassador Gangnam that night enjoyed seeing directly the new CEO talking about the group's new visions and strategies. The last 30 minutes of the conference was the highlight of the active communication with Q&A session between the staff from worldwide and the new CEO using email, fax and phone calls. A graduate of the Harvard Business School (MBA), Mr. Gilles Pélisson, the 49-year-old man who's a nephew of the founder of Accor Group, Mr. Gerald Pélisson, is now going to lead one of the top worldwide hotel groups with over 4,000 hotels throughout the world. He began his career with Accor in 1983 in the U.S.A. and then in the Asia-Pacific region. In particular, he served as Co-Chairman of the Novotel hotel chain. After 12-year working at Accor, he also had his career as CEO at Euro Disney, Suez and Bouygues Telecom from 1995 to 2005.